A lot of things happen in the orchard. You’d be amazed. It is just this kind of micro-theatre that we like to cover. What happens in the orchard does not have to stay in the orchard; not when we’re around. The snow did not fall this time, it simply spilled out of heaven, like thousands of featherbeds being emptied. Here in the Fruitbelt, we have mighty winters. The sharper the cold, the better the fruit. Save the mention of plastic, this prescription for tending a fruit orchard in winter could have been written a century ago. C.J. 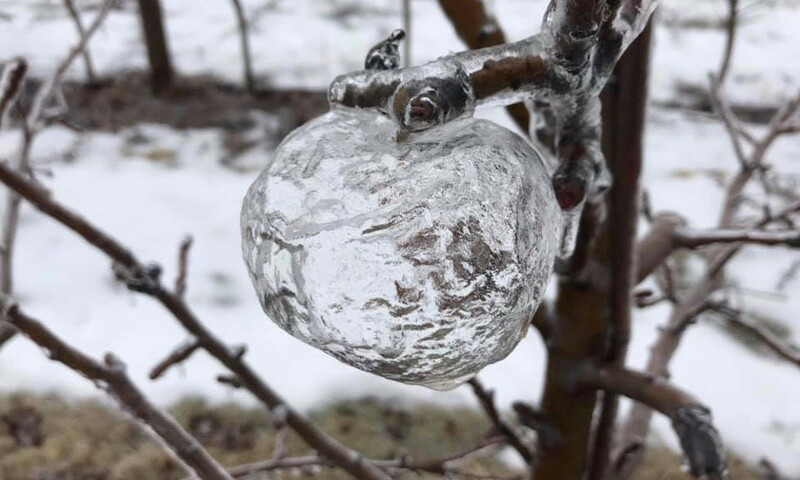 Walke, a Maine farmer and organic fruit grower, tells how to let mice and bees nest in a winter orchard while staving off voles from the young tree trunks. The purists can grab a couple of snowshoes and tamp down the snow into an ice barrier. The most important orchard chore to prepare for winter is protecting the tender trunk bark on young trees from hungry meadow voles. Voles can seriously damage or girdle and kill young trees by eating the bark and cambium layer at the base of the tree. Once the tree is girdled, water and nutrients can no longer move up and down the trunk, and the tree will die. A girdled tree will usually leaf out in the spring, and you’ll think it survived the gnawing, but it is using energy stored in buds and bark to leaf out. Once that energy is consumed, the leaves will turn brown and the tree will die. Bridge grafting in April is the best – but not guaranteed – way to try to save the girdled tree. To avoid losing a young tree, place vole guards around trunks before the first snowfall. This barrier prevents voles from eating the bark. Spiral plastic guards wrap around the tree trunk but must be removed in spring, since they can harbor insects and diseases if left. Plastic or metal mesh guards are loose fitting and can stay on year-round as long as you can enlarge them as the tree grows. Another trick is to compact the snow around trees with snowshoes so that it freezes into a hard ice pack. Voles cannot tunnel through this to get to the trees. Once the snow starts to fly, sit by the fire and start planning for the following orchard season.